Follow the work of all the special workers as they build a house from start to finish - from designing the plans to landscaping the yard. 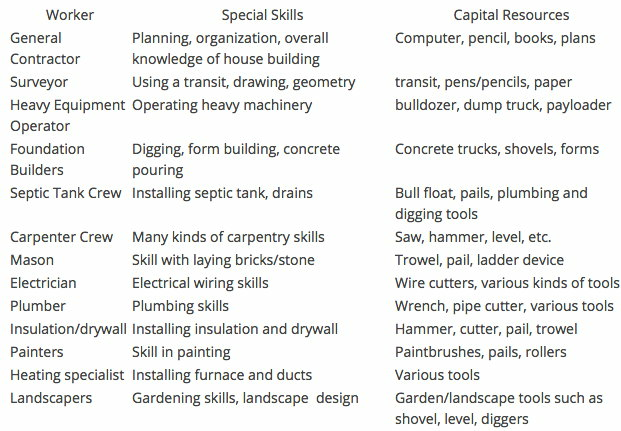 What a lot of special skills are needed! This colorful book also shows pictures of houses from different places and eras. Interested in using this resource in your classroom? Check out the posters that go along with this book: Specialization, Natural Resources, Human Resources, Capital Resources, Productive Resources. What are some of the kinds of natural resources that are needed to build the many kinds of houses pictured at the beginning and end of the book? Wood, stone, clay, tree bark, water/ice, animal skins, grass, stone caves, bamboo. What worker is in charge of building the house? What special types of workers does the general contractor hire to build the house? What special skills do these workers need to have? What capital resources (tools, equipment, machinery) do these workers use in their work? Why is it better to specialize when you make a product such as a house? You are able to produce more products since each worker only has to learn one skill a skill he likes and has mastered. Also, since each worker specializes, the workmanship should be better. How does using specialized workers create interdependence? All the workers depend on the other workers to accomplish their specific tasks.